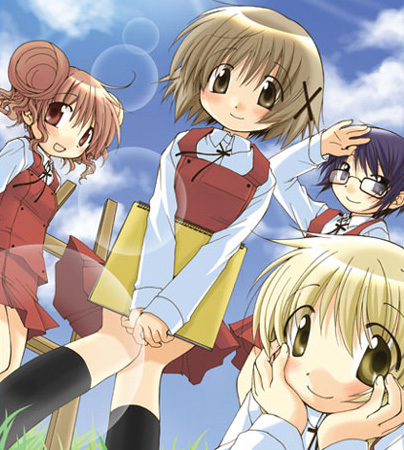 Do you love Hidamari Sketch and its characters? Yuno, Miya, Sae, Hiro and gorgeous Yoshinoya-sensei made your head go round? Then feel yourself free to join this club. 1. Be friendly and courteous towards your fellow members. The club is not the place to vent anger or aggression. 2. Feel free to share your experience and opinion, but please do not abuse your fellow members. 3. Please do not post the same message twice (do not cross post to other categories). Do not spam - if there is a category for your subject matter, post only there (especially website links). Have fun on the club, we are happy about all the buzz and friendly members hanging out here! The "Chō Hidamatsuri in Nippon Budōkan" event announced on Sunday that production on a new anime in the Hidamari Sketch franchise has been green-lit. The new anime will center on the graduation of the characters Sae and Hiro. Ryoko Shintani — the voice of Sae — confirmed the announcement on her blog after the event; the live program ran so late that the franchise's official Twitter account apologized to the attendees. We have ended the poll to detect the winner in a "Choose the avatar game". The winner avatar is now the official avatar of "Hidamari Sketch" club. It will be very good if you guys help us to add more Hidamari goods and figures to myfigurecollection.net, but please do not forget to tag this items (and photos, of course) to make it easier for us to link them to the club. Ha yes it was very fun :) Thank you! Thank you! :) We're gonna go bowling tonight and come home to celebrate! Gwennan (hace 5 años) #1905941He-he, I am not sure, that there will be any. Oh cool! It seems that's the case is a few places! Is that typical in Europe? Seems maybe North America celebrates in December, but I'm not sure about nations on other continents. spasepeepole026 (hace 5 años) #1904951They are :) I'm hoping for line of 1/8 or bigger Hidamari figures :) I'd have to get all of them! Thank you! Did yours go well? :)He-he, I am not sure, that there will be any. They are :) I'm hoping for line of 1/8 or bigger Hidamari figures :) I'd have to get all of them! spasepeepole026 (hace 5 años) #1901483Nice! :) I hope she turns out well! Nice! :) I hope she turns out well!